My name is Jake. Jake Mena. And I make; a lot. I build awesome stuff out of simple materials, mainly dealing with the dangerous. Knives out of RR spikes. Guns made of plumbing pipe. 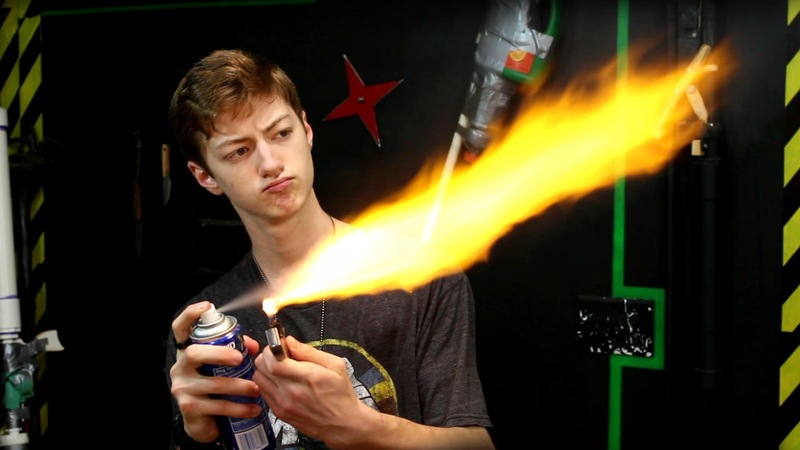 Flamethrowers with coffee creamer. A cannon that shoots footballs. 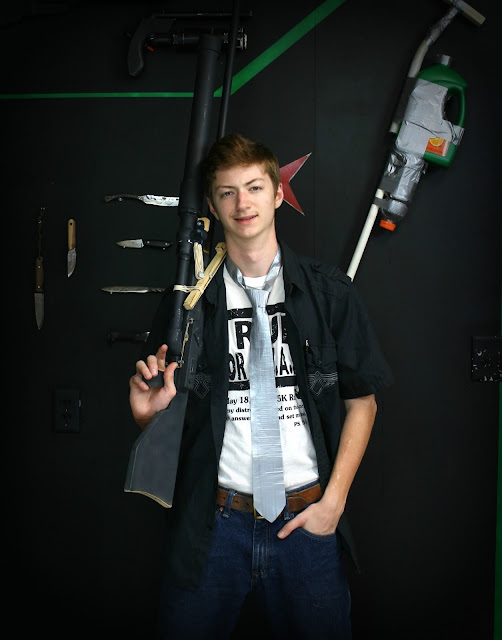 A necktie made of duct tape. Rockets. Explosions. Fire. No, I’m not your average 16 year old. Unlike most people my age, I don’t waste time playing video games. I don’t spend hours watching TV, and I don’t like social media. Mostly. Selfies? Don’t get me started. Rather, I prefer to use my head. Albeit, many times on things that other people see as rather strange. Not everyone possesses the same fascination with fire, they don’t get what's up with knives, and they ALL shake their head at my tie. But then again, if everyone was normal, the world would be so boring. People like me add the spice, the color, the fun, the danger to life. I like to write. I like to laugh. I am sarcastic. Very. And probably annoying. I am an introvert. I can write a hundred times better than I can talk. I don't like to be up in front of people. Ever. I am very opinionated, and sometimes I don't have an opinion. I love history. And science. I love math too. Except when I don’t. I love knives more. A lot more. I am the oldest child in a family of 12. Yep, there’s 10 kids. (jaws drop) Which makes me the commanding general. The army lives on 3 & 1/2 acres of land in the grand old USA, in the state of Mississippi, where it doesn't snow in the winter and in the summer you die. Other than the weather, I love where we live. Above all I am a Christian, striving to glorify God in all that I do. I work part time with my Dad, who is a contractor. We do all kinds of painting, remodeling, and general handyman type stuff. As a result, I have a lot of experience working with my hands. You probably have wondered how I know how to do everything you see on this website. Simple; I’ve working and building stuff since I was knee high to a grasshopper. On this website I post detailed articles with pictures, videos, tutorials, and other awesome resources on all of my crazy creations. I also post gear reviews and even have an Etsy store where you can buy some of the things I make. If you are one of those crazy people like me, you’re going to love it here. If you want to know more, read my posts, subscribe, write me a comment, or check out my YouTube channel. I am also active on Instructables.com, and I have posted a number of tutorials there. For those who want to get in touch with me, feel free to shoot me an email at jakedmena@gmail.com. If you spam me, I will DESTROY you. If you decide to build any of my projects, you do so at your own risk. I am not responsible if you blow yourself up with something you built with your hands at your house, regardless of if you saw me do it. Use common sense. If I showed you how to walk off a cliff does that make me responsible if you decide to? Likewise, if I show you how to make a bomb, if you decide to make it and blow yourself up, it ain't my fault. All the projects on this website functioned safely for me when I did them, in the way that I did them. I take no responsibility if you do them wrong. Okay? One more time: I am not responsible if you are injured attempting to construct or use anything you see on this website. Sorry about the above Disclaimer, I hate it being there as much as you do. If people were less stupid and had more common sense these days I wouldn't have to. If I didn't have it there I could get sued. I don't have time to be sued.